FastCast4u | [VIDEO] What are Mount Points and how to use them? Help | [VIDEO] What are Mount Points and how to use them? 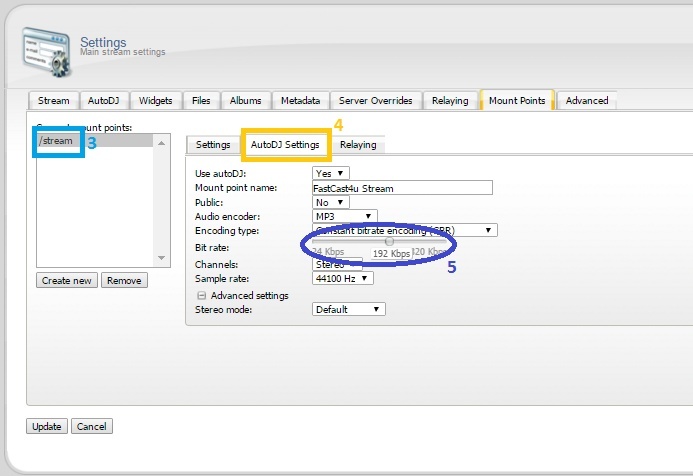 By using additional Mount Points, you can create multiple streams or music channels using one SHOUTcast v2 or Icecast v2 Radio Server. It is a great solution when you want to have streams in various bitrate or connect multiple encoders when broadcasting live. Notice: Your broadcasting software needs to support multiple Mount Points. Only one Auto DJ can be used per one server account. If you would like to create playlists using Auto Dj for each stream individually you need a second or another server account. 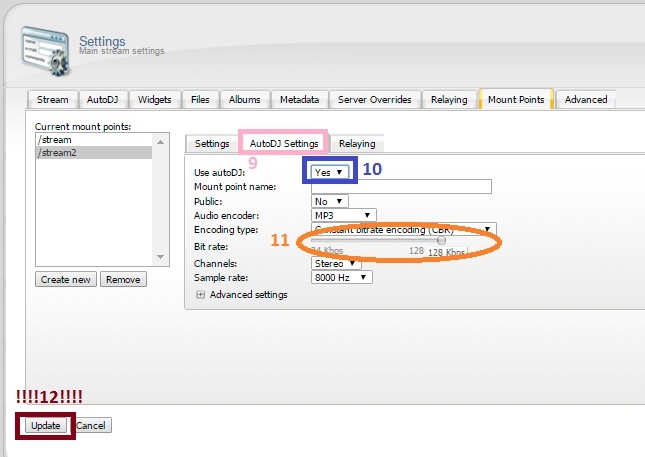 To have more streams you need to have SHOUTcast V2 server, appropriate amount of bitrate and additional Mount Points in your package. I need a high-quality PC stream (192 kbps) and lower bit rate stream for mobile users (128 kbps) to lessen their data usage. What should I do? I have 320 kbps package. 1) You need to buy additional Mount Point (Not required in Lite, Pro and VIP package). 2) Set your main mount point bit rate to 192 kbps. To do it, Follow the steps shown on the picture. 3. Select the main stream. 4. Choose AutoDJ Settings tab. 5. Set the bitrate to desired amount. 10. Change the "Use autoDJ" field to "Yes"
Remeber to restart the server after Updating the settings. Remember to configure your Broadcasting software properly by entering a proper name or a number of your mountpoint (SID). Use a number for SHOUTcast server and a name for IceCast servers.